Please Scroll Down to View the Kits and Accessories That were Chosen Specifically for this camera. NOTE: CAMERA IS DISCONTINUED AND NOT AVAILABLE ! IT IS STILL ON THE WEBSITE SO YOU CAN FIND COMPATIBLE ACCESSORIES IF YOU ALREADY OWN THIS CAMERA. Rebate may apply. Click here for Canon rebate info page. 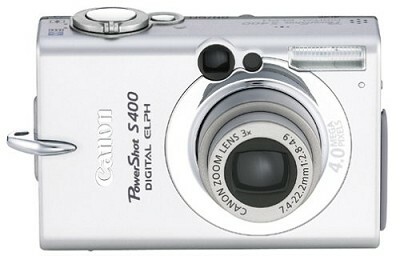 The newest Digital Elph in the Canon's PowerShot line, the compact S400 is both elegant and powerful. It features a 4-megapixel sensor, 3x optical zoom, an improved 3.6x digital zoom, and movie mode for videos of up to three minutes. A stainless steel shell protects the camera, while a Super Hard Cerabrite finish mixes metals and ceramics to produce a tough cool-toned, attractive exterior. Nine-point AiAF (Artificial intelligence Auto Focus) system for focusing accuracy, shutter speeds of 15 to 1/2,000 second, and fast sequence shooting at a rate of 2.5 frames per second (fps). Shoot up to three minutes of MPEG video at resolutions up to 320 x 240 pixels with sound, editing controls, and VCR-like playback. The camera can also attach voice memos or sound files of up to 60 seconds to each image. The DiG!C (DIGital Imaging Core) processor ensures excellent color rendition and white balance for every shot, as well as super-fast auto focusing, noise-free imaging, and advanced flash exposure performance. An ISO range of 50 to 400 ensures practical shutter speeds in a wide variety of lighting situations, while a multifunctional, built-in flash offers a maximum reach of 3.5 meters in Auto ISO mode. The camera is powered by a rechargeable lithium-ion battery NB-1LH (included).